Dentures have been used for many decades to replace missing teeth. They provide a satisfactory solution for many patients but can be problematic for a significant number of patients, especially those who have been missing all of their lower natural teeth for several years. With the passage of time, and in the absence of natural teeth, the jaw and gum bone shrinks away and provides less ‘gripping’ surface for a full lower denture resulting in dentures which move about and which are uncomfortable. Denture fixatives can be used to help increase the ‘grip’ but these are often sticky and messy. The modern solution to this problem is to use denture stabilisation techniques involving dental implants to increase the denture ‘grip’. The simplest form of this treatment involves the placement of 2 implants into the lower jaw and the incorporation of Locator attachments into the underside of the denture. These attachments then click into place over the implants and provide a secure grip. 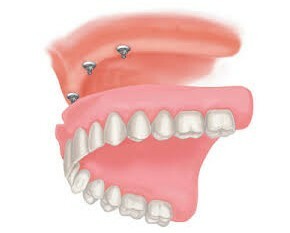 Additional implants can be used to increase the stabilisation even more. 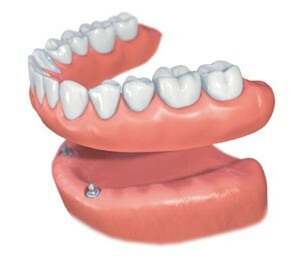 The fit of the denture then becomes much more secure and the patient’s quality of life is greatly improved. If loose or uncomfortable dentures are making your life unnecessarily difficult, please discuss this treatment option with us.